Brighton Says No to Kershaw’s Cuts! Hundreds of people marched together through central Brighton last Saturday, 6 April, in protest against £30m cuts proposed to Brighton & Sussex University Hospitals NHS Trust and the redundancies bound to result. 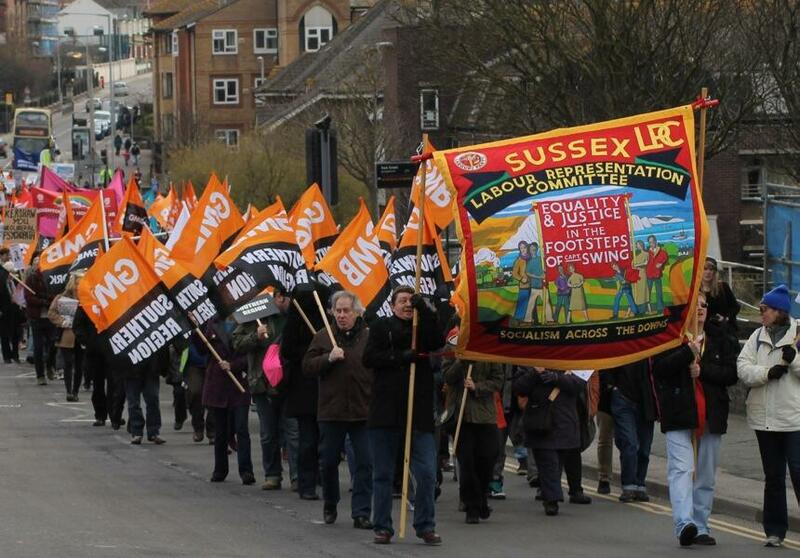 Sussex LRC was honoured to be asked to be the lead banner in the march. Thanks to our three banner carriers who bravely struggled in the infamous Brighton “breeze”. All were relieved that the march route didn’t go along the seafront! 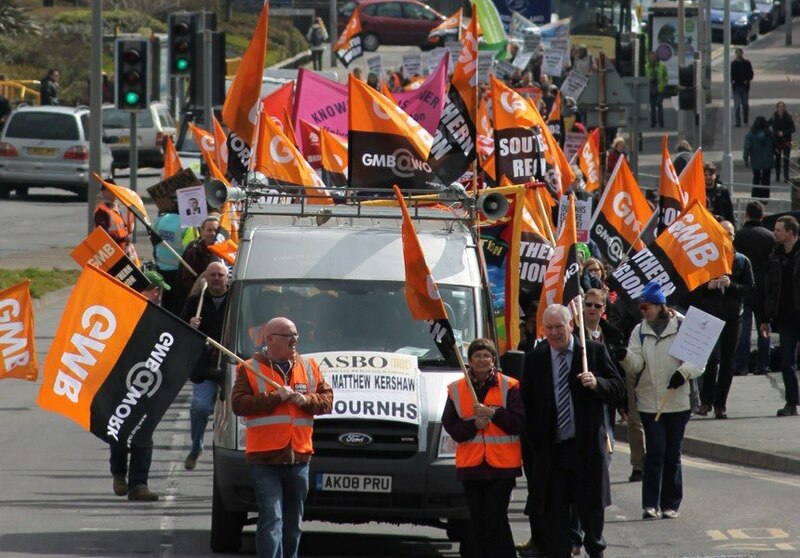 Jointly organised by the GMB trades union and Brighton Defend The NHS, members from many different groups brought their banners, flags and placards as well as large numbers to support the march. These included trades unions NUT, UCU, UNISON and UNITE, community groups and NHS campaigners Keep Our NHS Public, Brighton and Hove Women Against the Cuts, Brighton Benefits Campaign and Lewes Stop the Cuts, as well as Brighton, Hove & District Labour Party and members of the Green Party. All came together to voice united opposition to cuts proposed to our local NHS service. It was particularly encouraging to see so many students from Sussex University, taking time away from their leading anti-privatisation campaign, keen to both defend the NHS and return the solidarity they have received from local supporters, as Adriano Merola Marotta emphasised when he spoke. A well-attended rally heard some excellent speeches, notable among them Mick Foote – local GMB rep at the Royal Sussex County Hospital and the ever-amusing Mark Steel. A terrific array of photos and video footage of other speeches from Stephen McLean of UNISON and Labour’s Simon Burgess is available on the GMB Southern Region website. Those with limited time can get a feel of the protest by watching the GMB’s round-up video. While nurses warn of a hospital in crisis and local reports show BSUH NHS to be already under-resourced, leading to patient overcrowding and unnecessary risk, one pertinent UNITE placard pointed out that the damaging £30m cuts down here are a drop in the ocean of the huge £2.2bn NHS surplus in the last year. There is no logic to these attacks on our NHS apart from an intention to destroy the NHS as we know it, hand control of the NHS over to private contractors and, eventually, swap to a private insurance-based healthcare system, as in the USA. Matthew Kershaw, the new Chief Executive of BSUH NHS has form as the previous administrator of South London Healthcare Trust. He did the government’s bidding in reducing NHS provision, sacking health workers and privatising NHS assets and services in South London, then devastated the people of Lewisham by forcing the downgrade at Lewisham Hospital. 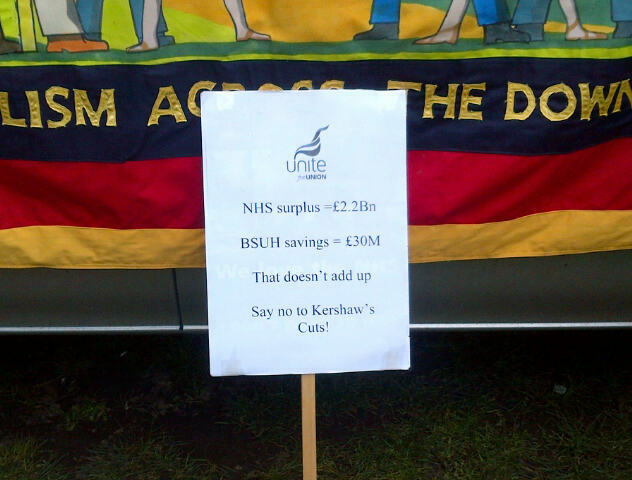 If you haven’t already, sign the petition against Kershaw’s £30m cuts to Brighton & Sussex NHS. We must resist this in Sussex at all costs. We repeat: remember the words of Nye Bevan: “The NHS will last as long as there are folk left with the faith to fight for it”. Now is definitely the time to fight. Take inspiration from the students at Sussex University: “Sussex United Will Never Be Defeated”!